The Black Hills uplift of southwest South Dakota exposes a Precambrian crystalline core of ~2560-2600 Ma basement granitoids nonconformably overlain by two Paleoproterozoic intracratonic rift successions. In the northern Black Hills, a 1-km-thick layered sill (the Blue Draw metagabbro) that intrudes the older rift succession provides a key constraint on the timing of mafic magmatism and of older rift-basin sedimentation. Ion microprobe spot analyses of megacrysts of magmatic titanite from a horizon of dioritic pegmatite in the uppermost sill portion yield a 207Pb/206Pb upper-intercept age of 2480 ± 6 Ma (all age errors ±2σ). In contrast, nearly concordant domains in coexisting magmatic zircon yield differentially reset spot-ages ranging from 2458 ± 16 to 2284 ± 20 Ma. We interpret these data as indicating an episode of gabbroic magmatism occurred at 2480 Ma, in response to earlier rifting of the eastern edge of the Wyoming craton. Layered mafic intrusions of similar thickness and identical age occur along a rifted belt in the southern Superior craton (Sudbury region, Ontario), and they are spatially aligned with the Blue Draw gabbro in a Kenorland restoration of the Wyoming and Superior cratons. We propose that layered mafic intrusions extending from Nemo, South Dakota to Sudbury, Ontario delineate an axial rift zone along which Wyoming began to separate from Superior during initial fragmentation of the Neoarchean supercontinent at ≥2480 Ma. Swarms of mafic dikes and sills, a typical fingerprint of continental rifting, can be used to constrain the timing of supercontinent breakup or attempted breakup (Ernst and Buchan 2001). For instance, intrusion of the 2475-2446 Ma Matachewan-Hearst mafic dike swarm (Heaman 1997) and the 2490-2475 Ma East Bull Lake suite of layered mafic intrusive rocks (James et al. 2002) are widely interpreted as indicating early Paleoproterozoic, mantle-plume driven, intracontinental rifting centered near Sudbury, Ontario (southern Superior craton), during the onset of Kenorland breakup. In their proposed scenario, Roscoe and Card (1993) envisioned the Wyoming craton as the continental landmass that rifted away from the southern Superior portion of Kenorland, before moving rapidly west and docking with supercontinent Laurentia at ~1850-1715 Ma (Dahl et al. 1999). Roscoe and Card (1993) inferred their pre-2500 Ma Wyoming-Superior reconstruction (Kenorland) largely using a stratigraphic “piercing point,” namely the present boundaries of the Paleoproterozoic Snowy Pass and Huronian Supergroups exposed in SE Wyoming and southern Ontario, respectively. These extensive packages of rift-basin sedimentary rocks are strikingly similar, both having an older (~2450-2100 Ma) epicratonic rift facies succeeded by a ~2100-1800 Ma passive margin sedimentary package. Following this reconstruction, the SE Wyoming craton would have lain immediately south of present-day Lake Superior and the north shore of Lake Huron in northern Michigan and southernmost Ontario. More recently, Bleeker (2003) and Bleeker and Ernst (2006) have proposed a somewhat different configuration for Kenorland, referred to as supercraton Superia, in which the eastern Hearne craton was also attached to the southern Superior craton. In the Superia configuration, the Wyoming craton still lies south of the Superior Province, sandwiched between the Hearne craton to the east (Bleeker and Ernst 2006) and the Minnesota River Valley terrane to the west (Roscoe and Card 1993). Recent paleomagnetic and geochronological data from the central Wyoming craton support the hypothesis that the Huronian and Snowy Pass Supergroups were adjacent to each other at ~2170 Ma and thus may have evolved as a single sedimentary rift basin between 2450 and 2100 Ma (Harlan et al. 2003). After ~2100 Ma, the Wyoming craton is thought to have rifted away from the southern Superior craton (Roscoe and Card 1993), a scenario that is consistent with occurrence of a 2076-2067 Ma plume centered just south and east of the Superior craton and MRV, respectively (Schmitz et al. 2006). Other workers, arguing that the Huronian-Snowy Pass time-stratigraphic correlation is not particularly unique in the Proterozoic sedimentary record, consider the Kenorland and Superia configurations as also non-unique. For example, Cox et al. (2000) have proposed that the SE Wyoming craton was once connected to the western Slave craton of Canada as part of the pre-2500 Ma supercraton Sclavia (Bleeker and Ernst 2006). Laramide uplifts in the eastern and southeastern Wyoming craton provide the only regional exposures of Precambrian crystalline rocks, and therefore represent strategic locations for testing proposed pre-2500 Ma connections between the Wyoming craton and the Superior or Slave cratons. We present new U-Th-Pb isotopic data for magmatic titanite and zircon from a prominent mafic intrusive body in the Laramide Black Hills uplift (Fig. 1). Located near Nemo, South Dakota, the Blue Draw metagabbro (BDM; Fig. 2), is a one-kilometer-thick layered sill. From bottom to top, its layered structure exposes: serpentinite, hornblendite, hornblende-plagioclase gabbro to diorite, biotite granodiorite, and discontinuous dioritic pegmatite (Woo 1952; Redden 1981). We have determined a concordant magmatic titanite age of 2480 ± 6 Ma (±2σ) from this body, suggesting that Paleoproterozoic rifting and related sedimentation in the easternmost Wyoming craton are ~300 Myr older than previously recognized (cf. Redden et al. 1990). Moreover, this 2480 Ma age ostensibly precludes a Wyoming-Slave connection because rift-related mafic rocks of this age are not recognized in the Slave craton (Bleeker and Ernst 2006). 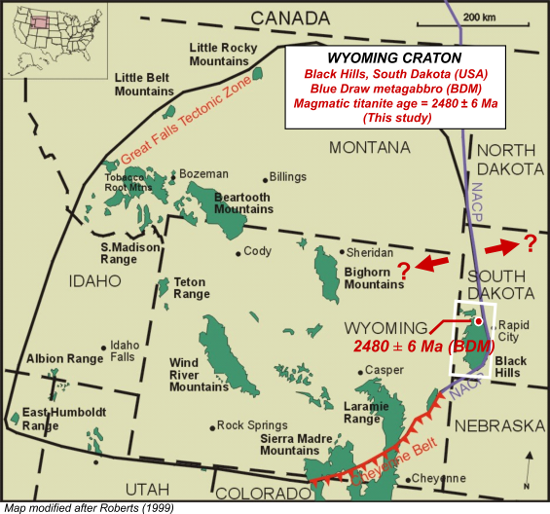 Instead, our result potentially provides an important new link connecting the eastern Wyoming craton to the southern Superior craton. Figure 1: Map of the Archean Wyoming craton bounded by Paleoproterozoic mobile belts associated with ~1860-1700 Ma assembly of southern Laurentia. Specifically, the Great Falls tectonic zone GFtz, north), Cheyenne belt (CB, south); and Trans-Hudson orogen (THO, east) delineate zones along which Wyoming craton collided with the Medicine Hat block, Yavapai arc terrane, and Superior craton, respectively. Terminal collisions occurred at ~1770-1760 Ma along the GFtz (Mueller et al. 2002), at ~1760-1750 Ma along the CB (Chamberlain 1998), and at ~1760-1710 Ma along the Dakota segment of the THO (Dahl et al. 2005). Red arrows highlight zone of possible 2480 Ma rifting along the eastern Wyoming craton margin (present coordinates), during incipient breakup of Kenorland/Superia. This new inference is based upon a 2480 Ma age of magmatic titanite, which dates Blue Draw metagabbro intrusion (Black Hills, this study). Locations of Laramide block uplifts (including the Black Hills) are shown in green. Black Hills portion of THO corresponds to North American Central Plains anomaly (NACP). The Archean Wyoming province (Fig. 1; Fig. 2, left inset) is bounded on its north, east, and southeast margins by Paleoproterozoic orogenic belts that were active when the craton collided with SW Laurentia between ~1865-1715 Ma (Dahl et al. 2005). The Black Hills constitute a Laramide block uplift located at the eastern margin of the Wyoming craton (Figs. 1-2). The crystalline core of the uplift (Fig. 2, left) exposes a Precambrian complex of diverse sedimentary and igneous rocks metamorphosed from low to high grade. In the Nemo locality, which is the focus of this study, Neoarchean basement rocks include a biotite-feldspar gneiss (BFG); and the 2559 ± 6 Ma Little Elk granite (LEG), which intrudes the BFG. This complex is overlain by two Paleoproterozoic rift successions that were deposited between 2550-1880 Ma (Redden et al. 1990) and multiply metamorphosed between 1810-1710 Ma (Dahl et al. 2005). The older rift succession − consisting of metamorphosed conglomerate, sandstone, and iron formation − is older than the BDM (which intrudes it) but younger than the 2560 Ma basement upon which it rests (Fig. 2, right). The younger succession is areally predominant throughout the Black Hills (Fig. 2, left) but in the Nemo locality is comprised of the Estes metaconglomerate with subordinate marble, meta-iron formation, and metabasalt (Fig. 2, right). Dahl and McCombs (2005) bracketed deposition of this younger suite between ~2100-1880 Ma, based upon published geochronology and chemostratigraphy (Redden et al. 1990; Bekker et al. 2003). The two rift successions are separated both in space and time by the Estes unconformity (EU; Fig. 2, right), an ancient erosional surface that postdates both Boxelder Creek sandstone deposition and BDM intrusion but predates deposition of the Estes conglomerate (Fig. 2, right). 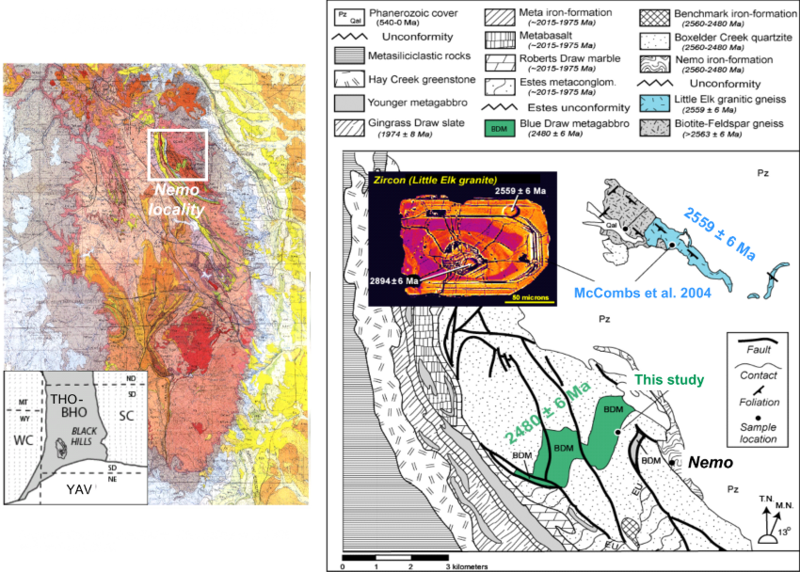 Figure 2: Left: Generalized geologic map of the Black Hills uplift, South Dakota, the crystalline core of which is underlain by Neoarchean basement and Paleoproterozoic cover rocks. Inset shows location of the Black Hills relative to nearby: Wyoming (WC) and Superior (SC) cratons, 1900-1800 Ma Trans-Hudson (THO) and 1800-1700 Ma Black Hills (BHO) orogens, and Yavapai arc terrane (YAV). Boxed area highlights the Nemo locality (this study). Right: Detailed geologic map of the Nemo area, northern Black Hills (enlargement of boxed area, left). Map shows distributions of the Blue Draw metagabbro (BDM), associated lithologies, and the Estes unconformity (EU). Pz = Paleozoic; Qal = Quaternary alluvium. Within the uppermost BDM is shown the location of dioritic pegmatite sample JAM-14a, which was selected for 207Pb/206Pb dating of titanite and zircon (this study). The BDM layered sill was: (1) intruded into horizontal (Boxelder Creek) sandstone and (Benchmark) Iron Formation (Fig. 2, right); (2) differentiated horizontally upon cooling and solidification; (3) possibly folded (with older sedimentary rocks) on a NW-trending axis; (4) nonconformably overlain by the younger rift succession, atop the Estes unconformity; (5) structurally overturned (with the unconformity and adjacent sedimentary rocks) on a ~NE-SW-trending axis; and (6) (re-)folded on a NW-trending axis (with the unconformity and adjacent sedimentary rocks) during the Wyoming-Superior collisional orogeny (DeWitt et al. 1989; Redden et al. 1990; Dahl et al. 1999). These events are summarized in the geologic map of the Nemo locality (Fig. 2, right), from which it is possible to gain a stratigraphic and structural cross section by viewing the map upside down (Redden 1987). Dioritic pegmatite in the uppermost part of the Blue Draw layered sill was sampled for titanite and zircon. This particular horizon was targeted for isotopic analysis of magmatic minerals on the expectation that gravity differentiation following BDM intrusion would have pre-concentrated radioactive large-ion lithophile elements therein (e.g., K, Rb, U, and Th, etc.). The dioritic pegmatite contains the assemblage plagioclase, quartz, titanite, hornblende, biotite, and accessory rutile and zircon. A sample of this pegmatite (JAM-14a) was crushed and sieved to grain sizes ranging from >400 to 400-40 µm in order to extract several megacrysts of titanite, and to obtain a high-quality zircon separate (using heavy liquids and magnetic separation), respectively. Titanite and zircon grains were analyzed isotopically by ion microprobe (SHRIMP) at Stanford/USGS (California) and the Geological Survey of Canada, respectively. Titanite grains in the upper, dioritic-pegmatite horizon of the BDM are brown, randomly oriented, subhedral to euhedral, and megacrystic (suggesting a magmatic origin). Individual grains display petrographic and BSE (back-scattered-electron) evidence for two growth generations in which texturally older interiors are reddish-brown and BSE-bright whereas younger clear rims are BSE-darker. Electron probe analysis of the grains reveals modest variation in cationic Al/Fe ratios, ranging from 1.2 (core) to 0.6 (rim), and abundances of minor Ce2O3 and trace Nb2O5 ranging from 0.3-0.5 wt% and 0.00-0.05 wt%, respectively (McCombs 2002). SHRIMP analyses of individual megacrysts reveal a pronounced intergranular variability in Th/U ratio, ranging from 2.1-3.0 to 4.7-6.2. These Th/U, Al/Fe, Ce, and Nb signatures indicate magmatic, not metamorphic, origin for the BDM titanite, according to the discriminant criteria established by Aleinikoff et al. (2002) and Wintsch et al. (2005). SHRIMP spot-age determinations of the discrete compositional domains noted above for the titanite revealed no measurable age difference at the ~30 µm analytical scale. A precise, weighted mean 207Pb/206Pb age of 2479 ± 6 Ma (2σ) is reported here on the basis of 16 spot analyses of two grains (Fig. 3a, inset). An upper-intercept age of 2480 ± 6 Ma (2σ) anchored to a lower intercept of 58 ± 5 Ma (age of nearby Tertiary intrusions) is also obtained in Fig. 3a by excluding only spot 1.9, which exhibits relatively high common 206Pb, whereas, free regression of all the data yields comparable upper and lower intercept ages (within error) of 2484 ± 11 and 215 ± 310 Ma, respectively. The Blue Draw gabbro was intruded into cold sedimentary country rock (Redden 1987), and during subsequent polyphase metamorphism this suite of rocks never exceeded garnet-grade temperatures. Assuming a Pb closure temperature for titanite of ~680-700 °C or higher for grains with an effective diffusion radius of 1 mm (e.g., Dahl 1997), the titanite ages reported here clearly establish a 2480 Ma intrusive age for the Blue Draw mafic sill. Figure 3: U/Pb concordia plots of SHRIMP data obtained for titanite and zircon in dioritic pegmatite sample JAM-14a. (a) Plot for titanite (16 spot analyses of two grains), in which upper intercept yields a 207Pb/206Pb age of 2480 ± ± 6 Ma with the lower intercept anchored to the known age of nearby Tertiary intrusions. Inset shows weighted mean 207Pb/206Pb age of 2479 ± 6 Ma obtained for the same 16 analyses. All ages reported with 2σ errors. (b) Plot for zircon (10 spot analyses of six grains), with data ellipses labeled with grain/spot numbers. The data show a pattern of disturbed ages within and among the grains, spread out more or less along concordia. For BDM zircon, measured Th/U ratios analyzed within six grains range from ~0.2 to ~0.7 which. Coupled with the consistent oscillatory zoning and skeletal morphologies mentioned earlier, and the age relationships shown in Fig. 3, these observations support a primary magmatic rather than inherited or metamorphic origin for the zircon. Imaging of zircon from sample JAM-14a reveals that only restricted parts of most grains are non-metamict and therefore suitable for age determination. Yet, as illustrated in Fig. 3b, even the SHRIMP U-Pb microanalyses of relatively pristine and concordant domains within these zircon grains reveal complex age relationships. Specifically, the individual SHRIMP spots are arrayed as a spread of apparent ages along or near concordia (Fig. 3b) between 2458 ± 16 and 2284 ± 20 Ma, which is tentatively interpreted as indicating that ~2475 Ma zircon experienced a metamorphic disturbance at ~2260 Ma. This metamorphism may correspond to the early folding event noted above, which affected the older sedimentary package and the BDM but not the younger sedimentary package. In summary, the 2480 Ma intrusive age of the BDM constrains the depositional age of the older sedimentary package between 2560-2480 Ma. Combining this result with the inferred 2100-1800 Ma depositional age of the younger package (as noted above) implies that the intervening Estes unconformity (Fig. 2, right) represents a hiatus of 2480-2100 Ma. Within this broad timeframe, however, the unconformity per se could be younger than ~2260 Ma. The location of the Wyoming craton in a late Neoarchean supercontinent is the subject of active debate. The main “piercing point” proposed in the original Kenorland reconstruction was the Paleoproterozoic rift- to passive-margin sequences exposed in SE Wyoming (Snowy Pass Supergroup) and southern Ontario (Huronian Supergroup), which Roscoe and Card (1993) envisioned as once comprising a common depocenter (Fig. 4a). Although supported by subsequent paleomagnetic and geochronologic data (Harlan et al. 2003), the non-unique characteristics of the two supergroups and the poor geochronologic resolution of presumed Black Hills equivalent rocks requires more rigorous testing of their proposed reconstruction. In this regard, a narrowed 2560-2480 Ma depositional timeframe for the older sedimentary rift succession in the Black Hills (cf. ~2560-2170 Ma prior to this study) strengthens stratigraphic correlation of the Boxelder Creek sandstone (Nemo, South Dakota) and the ~2450 Ma Magnolia sandstone (Snowy Pass Supergroup, SE Wyoming: Aspler and Chiarenzelli 1998; Bekker and Eriksson 2003; Bekker et al. 2003). Moreover, the revised, older age of the Boxelder Creek sandstone also aligns it temporally with the Livingstone Creek sandstone of the Huronian Supergroup (southern Ontario; Fig. 4a), which is cut by 2480-2490 Ma mafic layered plutons of the East Bull Lake intrusive suite (EBL; James et al. 2002). Thus, the near-synchroneity of basal rift-basin sedimentation in SE Wyoming, S. Ontario, and the Black Hills is permissive of the existence of a single epicratonic basin of facing rift margins at 2500-2450 Ma. Figure 4: Final assembly of supercontinent Kenorland, showing cratonic elements amalgamated by ~2600-2550 Ma, with juxtaposition of the southern Superior (with Minnesota River Valley terrane, MRV) and eastern Wyoming cratons, and its subsequent dispersal between ~2500-2100 Ma (modified after Williams et al. 1991, Roscoe and Card 1993, and Harlan et al. 2003). (a) Principal igneous activity affecting the Superior craton between ~2480-2450 Ma includes the giant radiating swarm of 2473-2446 Ma Matachewan diabase dikes and the 2490-2475 Ma mafic layered intrusions of the East Bull Lake suite (EBL), while in the eastern Wyoming craton the 2480 Ma Blue Draw metagabbro (BDM) intrudes the Black Hills (BH, this study). Panel also shows a possible plume source for the mafic magmatism (dimensions of plume head schematic only), as well as clastic sedimentary prisms deposited in incipient rifting basins. (b) Illustrates the ~2170 Ma intrusive events that affected the Superior craton (2172-2167 Ma Biscotasing dike swarm) and their temporal equivalent in the Wyoming craton (2170 ± 8 Ma quartz diorite dike [QD]). Approximate possible position for Wyoming craton, as partly constrained by paleomagnetic data of Harlan et al. (2003) and by QD dike orientation. (c) 2125-2090 Ma mafic magmatic events affecting Superior (2125-2101 Ma Marathon dike swarm) and Wyoming (2092 ± 9 Ma gabbro [SPG] intruding Snowy Pass Supergroup) cratons. Subsequent magmatism in Superior craton at 2077-2067 Ma (radiating Fort Frances dike swarm), and in Wyoming craton at 2060 ± 6 Ma (metadiabase [T]; Tobacco Root Mountains) and 2011 ± 1 Ma (Kennedy dike swarm [K]; Laramie Range), are shown for reference. 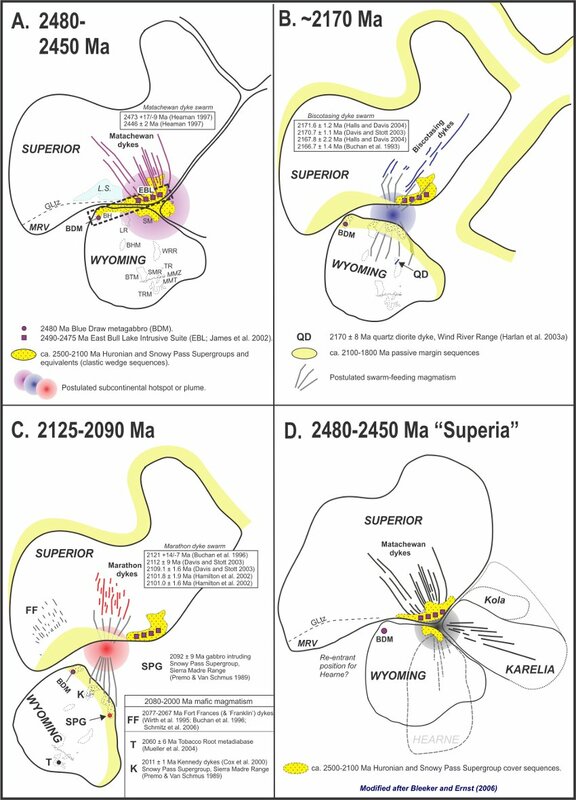 (d) Proposed reconstructions of supercraton Superia, showing Hearne-Superior-Karelia juxtaposition (modified after Bleeker [2003, 2004] and Bleeker and Ernst ) and alternative Wyoming-Superior-Karelia juxtaposition (this study). Other abbreviations: GLtz = Great Lakes tectonic zone; L.S. = Lake Superior; BHM = Bighorn Mountains; BTM = Beartooth Mountains; LR = Laramie Range; SM = Sierra Madre Range; TR = Teton Range; TRM = Tobacco Root Mountains; MMT = Montana Metasedimentary terrane; MMZ = Madison mylonite zone (Erslev and Sutter 1990); and WRR = Wind River Range (cf. Fig.1). Continental rifting is commonly manifested in the emplacement of mafic igneous rocks on either side of the rift margins. For instance, the southern Superior craton contains extensive mafic rocks intruded at ~2490-2445 Ma (Matachewan dikes and EBL), 2217-2216 Ma (Nipissing-Senneterre sills and dikes), 2172-2167 Ma (Biscotasing dikes), 2125-2101 Ma (Marathon dikes), and 2077-2076 Ma (Fort Frances dikes), consistent with rifting or lithospheric extension during these times (Ernst and Buchan 2001; Hamilton et al. 2002). Elements of these stages at selected times are presented schematically as ‘snapshots’ in Figs. 4a, b, and c. In the earliest stage of this sequence, the older, 2473 +17/-9 Ma component of the voluminous Matachewan mafic dike swarm (Heaman 1997) and the 2490-2475 Ma mafic components of the EBL intrusive suite (James et al. 2002) intruded the south-central part and southern margin, respectively, of the Superior craton (Fig. 4a). However, a longstanding obstacle to linking the Wyoming craton to the southern Superior Province in the earliest Paleoproterozoic as considered above has been the apparent lack of rift-related rocks of 2500-2450 Ma age in the eastern Wyoming craton (e.g., Dahl et al. 1999; Harlan 2005). Significantly, the refined U-Pb age for the Blue Draw metagabbro documented in this study indicates for the first time that the easternmost Wyoming lithosphere was undergoing extension or rifting at 2480 Ma, simultaneous with emplacement of a 250-km-long belt of mafic layered intrusions extending ENE through Sudbury, Ontario (Fig. 4a). Moreover, the East Bull Lake intrusive suite aligns spatially with the Blue Draw metagabbro if the Superior and Wyoming cratons are restored to the Kenorland configuration proposed by Roscoe and Card (1993). This alignment of shallow-crustal, mafic plutonic rocks of identical age considerably strengthens the “piercing point” linking the Wyoming craton to southern Superior in a Kenorland fit (Fig. 4a). The Biscotasing, Marathon, and Fort Frances (or ‘Kenora-Kabetogama’, including the 2067 ± 1 Ma ‘Franklin’ dike of Schmitz et al. 2006) swarms likely reflect episodic plume or hotspot activity centered south of the Superior craton and east of the Minnesota River Valley terrane (Buchan et al. 1993, 1996; Ernst and Buchan 2001; Schmitz et al. 2006). This hypothesis is in agreement with that first proposed by Southwick and Day (1983), who suggested that the radiating Fort Frances diabase swarm could have been injected laterally from the southeast to the northwest, from a hotspot centered beneath the future site of the Animikie Basin. Consequently, Figures 4a-c imply that the pattern of magmatism from ~2480-2000 Ma in the southern Superior craton and parts of the Wyoming craton could be a consequence of progressive, relative motion of the rifting supercontinent over a single, very long-lived plume or hotspot. However, it is difficult to imagine a single, long-lived plume/lithosphere interaction. Rather, we favor a scenario in which a drifting Superior craton or amalgamated supercontinent precursor (Kenorland) periodically intersected upwelling plumes for shorter (<10 My) or longer (20-40 My) intervals during which mantle-derived gabbroic melts were transferred to the crust. Figure 4b shows that, at 2170 Ma, much of the southern and eastern Superior craton was bisected by the extensive (>300,000 km2) Biscotasing diabase swarm (Buchan et al. 1993; Halls and Davis 2004). On the presumed opposite side of this rift margin, in the south-central Wyoming craton (present day coordinates), this swarm is ostensibly matched by a 2170 ± 8 Ma quartz diorite dike that cuts Archean supracrustal units in the southern Wind River Range of Wyoming (Harlan et al. 2003). Paleomagnetic study of this dike led Harlan et al. (2003) to conclude that a closest-approach fit constrained by paleolatitude is permissive of the Wyoming-Superior craton reconstruction proposed by Roscoe and Card (1993). The fit shown in Fig. 4b is similar to this closest-approach fit but implies some separation and clockwise rotation of the Wyoming craton after 2450 Ma. The Marathon diabase dikes define a broad, north-trending swarm north of Lake Superior and have been dated precisely as a series of brief, episodic magmatic pulses intruding the south-central Superior Province between 2121-2101 Ma (Buchan et al. 1996; Hamilton et al. 2002; Davis and Stott 2003). Figure 4c shows a possible temporal equivalent (within analytical error) of this mafic magmatism in the southern Wyoming craton – a metagabbro plug that intruded clastic sediments (Cascade Quartzite) of the lower Snowy Pass Supergroup in the Sierra Madre Range, at 2092 ± 9 Ma (Premo and Van Schmus 1989). Because of a lack of primary paleomagnetic poles from the Wyoming craton at this time (~2100 Ma), the degree of relative clockwise rotation of Wyoming away from Superior is not constrained. However, the amount of azimuthal drift shown in Fig. 4c is consistent with the spatial distribution of mafic, hotspot-fed magmatism on both cratons at 2125-2090 Ma. Moreover, repeated dike swarm magmatism at 2077-2067 Ma (Fort Frances/‘Franklin’ dikes; Wirth et al. 1995; Buchan et al. 1996; Schmitz et al. 2006) and 2011 ± 1 Ma (Kennedy dikes; Cox et al. 2000) is also consistent with this geometry (Fig. 4c). Fit of the Superior and Wyoming cratons at 2480-2450 Ma may also be assessed using the recent configuration for supercraton Superia (Bleeker 2003, 2004; Bleeker and Ernst 2006), and is shown in Figure 4d. These authors have proposed, on the basis of possible 2450 Ma dike correlation and similarities in basement-cover sequence geology, that the Hearne craton may have occupied a position abutting the (present day) south margin of the Superior craton adjacent to Karelia (dashed outline in Fig. 4d). In this reconstruction, the Wyoming craton was speculated to have occupied a wide re-entrant west of the Hearne and south of the Superior cratons. However, using the same relative Wyoming-Superior orientation as in the modified Roscoe and Card (Kenorland) reconstruction, we note that an excellent fit is made with a triple junction formed between Superior-Wyoming and a third cratonic fragment identified by Bleeker and Ernst (2006) to be Karelia. This relationship is significant irrespective of whether the Wyoming craton was immediately adjacent to Karelia, as we propose, or whether the Hearne craton was intervening (Bleeker 2004, Bleeker and Ernst 2006). Evident from the possible paleocontinental fits shown in Figures 4a and d is the principal conclusion that the reconstructions of Roscoe and Card (1993) and Bleeker and Ernst (2006) are mutually incompatible. There is inadequate space and insufficient rotational freedom in the Hearne craton paleomagnetic data set (~2450 Ma Kaminak dikes, summarized in Bleeker 2004) for this craton to have occupied the apparent re-entrant between the Wyoming craton and the Minnesota River Valley (MRV) region of the Superior craton (Fig. 4d). Likewise, the Wyoming craton cannot be accommodated easily in a space west of a Hearne-Karelia amalgamation and south of the Superior craton (present-day coordinates). The primary paleopole data for Karelia at 2450 Ma is incompletely understood, but nonetheless suggests that this craton did not occupy the position shown in Fig. 4d (Mertanen et al. 1999; Pesonen et al. 2003). However, any space thereby liberated by Karelia cannot simply be replaced by the Hearne craton, because the paleomagnetic data for the latter again constrain any rotations to have been far smaller than required. Therefore, it appears that there was insufficient space to have accommodated both the Wyoming and Hearne cratons around the south margin of Superior craton in the modified Superia fit suggested here (Fig. 4d). We conclude that the corridor of layered mafic intrusions from Sudbury to Nemo (dashed rectangle in Fig. 4a) represents a single axial rift zone along which Superior began to separate from Wyoming during the incipient breakup of Kenorland or Superia at ~2480 Ma. Following this model, Wyoming-Superior separation was complete by ~2100 Ma or shortly thereafter, as evidenced by the younger dikes noted above in both cratons. Between ~2100-1865 Ma, the Wyoming craton appears to have remained adrift in a westward direction (modern coordinates, relative to Superior) until it docked once again with the Superior craton, beginning at ~1865 Ma, as part of Laurentia. Aleinikoff, J.N., Wintsch, R.P., Fanning, C.M., and Dorais, M.J. 2002. U-Pb geochronology of zircon and polygenetic titanite from the Glastonbury Complex, Connecticut, USA: an integrated SEM, EMPA, TIMS, and SHRIMP study. Chemical Geology, 188: 125-147. Aspler, B.A., and Chiarenzelli, J.R. 1998. Two Neoarchean supercontinents? Evidence from the Paleoproterozoic. Sedimentary Geology, 120: 75-104. Bekker, A., and Eriksson, K.A. 2003. A Paleoproterozoic drowned carbonate platform on the southeastern margin of the Wyoming Craton: a record of the Kenorland breakup. Precambrian Research, 120: 327-364. Bekker, A., Karhu, J.A., Eriksson, K.A., and Kaufman, A.J. 2003. Chemostratigraphy of Paleoproterozoic carbonate successions of the Wyoming craton: tectonic forcing of biogeochemical change? Precambrian Research, 120: 279-325. Bickford, M.E., Wooden, J.L., and Bauer, R.L. 2006. SHRIMP study of zircons from Early Archean rocks in the Minnesota River Valley: implications for the tectonic history of the Superior Province. Geological Society of America Bulletin, 118: 94-108. Bleeker, W. 2003. The late Archean record: a puzzle in ca. 35 pieces: Lithos, 71: 99-134. Bleeker, W. 2004. Taking the pulse of planet Earth; a proposal for a new multi-disciplinary flagship project in Canadian solid earth sciences. Geoscience Canada, 31: 179-190. Bleeker, W., and Ernst, R. 2006. Short-lived mantle generated magmatic events and their dyke swarms: the key unlocking Earth's paleogeographic record back to 2.6 Ga. In Dyke Swarms - Time Markers of Crustal Evolution. Edited by E. Hanski, S. Mertanen, T. Rämö, and J. Vuollo. A.A. Balkema Publishers, Rotterdam. In press. Buchan, K.L., Halls, H.C., and Mortensen, J.K. 1996. Paleomagnetism, U-Pb geochronology, and geochemistry of Marathon dykes, Superior Province, and comparison with the Fort Frances swarm. Canadian Journal of Earth Sciences, 33: 1583-1595. Buchan, K.L., Mertanen, S., Park, R.G., Pesonen, L.J., Elming, S.-Å., Abrahamsen, N., and Bylund, G. 2000. Comparing the drift of Laurentia and Baltica in the Proterozoic: the importance of key paleomagnetic poles. Tectonophysics, 319: 167-198. Buchan, K.L., Mortensen, J.K., and Card, K.D. 1993. Northeast-trending Early Proterozoic dykes of southern Superior Province: multiple episodes of emplacement recognized from integrated paleomagnetism and U-Pb geochronology. Canadian Journal of Earth Sciences, 30: 1286-1296. Chamberlain, K.R. 1998. Medicine Bow orogeny: Timing of deformation and model of crustal structure produced during continent-arc collision, ca. 1.78 Ga, southeastern Wyoming. Rocky Mountain Geology, 33: 259-277. Cox, D.M., Frost, C.D., and Chamberlain, K.R. 2000. 2.01-Ga Kennedy dike swarm, southeastern Wyoming: record of a rifted margin along the southern Wyoming province. Rocky Mountain Geology, 35: 7-30. Dahl, P.S. 1997. A crystal-chemical basis for Pb retention and fission-track annealing systematics in U-bearing minerals, with implications for geochronology. Earth and Planetary Science Letters, 150: 277-290. Dahl, P.S., Holm, D.K., Gardner, E.T., Hubacher, F.A., and Foland, K.A. 1999. New constraints on the timing of Early Proterozoic tectonism in the Black Hills (South Dakota), with implications for the docking of the Wyoming province with Laurentia. Geological Society of America Bulletin, 111: 1335-1349. Dahl, P.S., and McCombs, J.A. 2005. “Rosetta grains” of Precambrian accessory minerals, Black Hills, South Dakota: 2900-1700 Ma microprobe ages and implications for regional tectonic history. The Compass, 78: 59-75. Dahl, P.S., Terry, M.P., Jercinovic, M.J., Williams, M.L., Hamilton, M.A., Foland, K.A., Clement, S.M., and Friberg, L.M. 2005. In situ microchronometry of metamorphic monazite (Black Hills, SD) and the timing of Paleoproterozoic thermotectonism in the eastern Wyoming Craton. American Mineralogist, 90: 1712-1728. Davis, D.W., and Stott, G.M. 2003. Geochronology of two Proterozoic mafic dike swarms in northwestern Ontario. In Summary of Fieldwork and Other Activities 2003, Ontario Geological Survey, Open File Report 6120, p.12-1 to 12-7. DeWitt, E., Redden, J.A. Wilson, A.B., and Buscher, D. 1989. Geologic map of the Black Hills area, South Dakota and Wyoming. United States Geological Survey Miscellaneous Investigation Series Map I-1910, scale 1:250,000. Ernst, R.E., and Buchan, K.L. 1993. Paleomagnetism of the Abitibi dyke swarm, southern Superior Province, and implications for the Logan Loop. Canadian Journal of Earth Sciences, 30: 1886-1897. Ernst, R.E., and Buchan, K.L. 2001. Large mafic magmatic events through time and links to mantle-plume heads. Geological Society of America Special Paper 352, p. 483-566. Erslev, E.A., and Sutter, J.F. 1990. Evidence for Proterozoic mylonitization in the northwestern Wyoming Province. Geological Society of America Bulletin, 102: 1681-1694. Frost, C.D. 1993. Nd isotopic evidence for the antiquity of the Wyoming province. Geology, 21: 351-354. Gosselin, D.C., Papike, J.J., Zartman, R.E., Peterman, Z.E., and Laul, J.C. 1988. Archean rocks of the Black Hills, South Dakota: reworked basement from the southern extension of the Trans-Hudson Orogen. Geological Society of America Bulletin, 100: 1244-1249. Halls, H.C., and Davis, D.W. 2004. Paleomagnetism and U-Pb geochronology of the 2.17 Ga Biscotasing dyke swarm, Ontario, Canada: evidence for vertical-axis crustal rotation across the Kapuskasing Zone. Canadian Journal of Earth Sciences, 41: 255-269. Hamilton, M.A., Davis, D.W., Buchan, K.L., and Halls, H.C. 2002. Precise U-Pb dating of reversely magnetized Marathon diabase dykes and implications for emplacement of giant dyke swarms along the southern margin of the Superior Province, Ontario. In Radiogenic age and isotopic studies. Report 15, Current Research 2002-F6, Geological Survey of Canada, pp. 1-8. Harlan, S.S., Geissman, J.W., and Premo, W.R. 2003. Paleomagnetism and geochronology of an Early Proterozoic quartz diorite in the southern Wind River Range, Wyoming, USA. Tectonophysics, 362: 105-122. Harlan, S.S. 2005. The Paleoproterozoic leopard dikes of Montana and Wyoming: a dismembered fragment of the 2.45 Ga Hearst-Matachewan giant radiating dike swarm of the Superior craton? Geological Society of America Abstracts with Programs, 37: 505. Heaman, L.M. 1997. Global mafic magmatism at 2.45 Ga: remnants of an ancient large igneous province. Geology, 25: 299-302. James, R.S., Easton, R.M., Peck, D.C., and Hrominchuk, J.L. 2002. The East Bull Lake Intrusive Suite: remnants of a ~2.48 Ga large igneous and metallogenic province in the Sudbury area of the Canadian Shield. Economic Geology, 97: 1577-1606. McCombs, J.A. 2002. Geochronology of Precambrian basement and adjacent rocks, Black Hills, South Dakota. Unpublished Masters thesis, Kent State University, Kent, Ohio, 104p. McCombs, J.A., Dahl, P.S., and Hamilton, M.A. 2004. U-Pb ages of Neoarchean granitoids from the Black Hills, South Dakota, USA: implications for evolution of the Archean Wyoming province. Precambrian Research, 130: 161-184. Mertanen, S., Halls, H.C., Vuollo, J.I., Pesonen, L.J., and Stepanov, V.S. 1999. Paleomagnetism of 2.44 Ga mafic dykes in Russian Karelia, eastern Fennoscandian Shield - implications for continental reconstructions. Precambrian Research, 98: 197-221. Mueller, P.A., Heatherington, A.L., Kelly, D.M., Mogk, D.W., and Wooden, J.L. 2002. Paleoproterozoic crust within the Great Falls tectonic zone; implications for the assembly of southern Laurentia. Geology, 30: 127-130. Pesonen, L.J., Elming, S.-Å., Mertanen, S., Pisarevsky, S., D’Agrella-Filho, M.S., Meert, J.G., Schmidt, P.W., Abrahamsen, N., and Bylund, G., 2003. Palaeomagnetic configuration of continents during the Proterozoic. Tectonophysics, 375: 289-324. Premo, W.R., and Van Schmus, W.R. 1989. Zircon geochronology of Precambrian rocks in southeastern Wyoming and northern Colorado. In Proterozoic Geology of the Southern Rocky Mountains. Edited by J.A. Grambling and B.J. Tewksbury. Geological Society of America Special Paper 335, pp. 13-32. Redden, J.A. 1981. Summary of the geology of the Nemo area. In Geology of the Black Hills, South Dakota and Wyoming. Edited by F.J. Rich. Geological Society of America Guidebook, American Geological Institute, Falls Church, VA, pp. 193-210. Redden, J.A. 1987. Early Proterozoic and Precambrian-Cambrian unconformities of the Nemo area, Black Hills, South Dakota: Geological Society of America Centennial Field Guide, pp. 219-225. Redden, J.A., Peterman, Z.E., Zartman, R.E., and DeWitt, E.R. 1990. 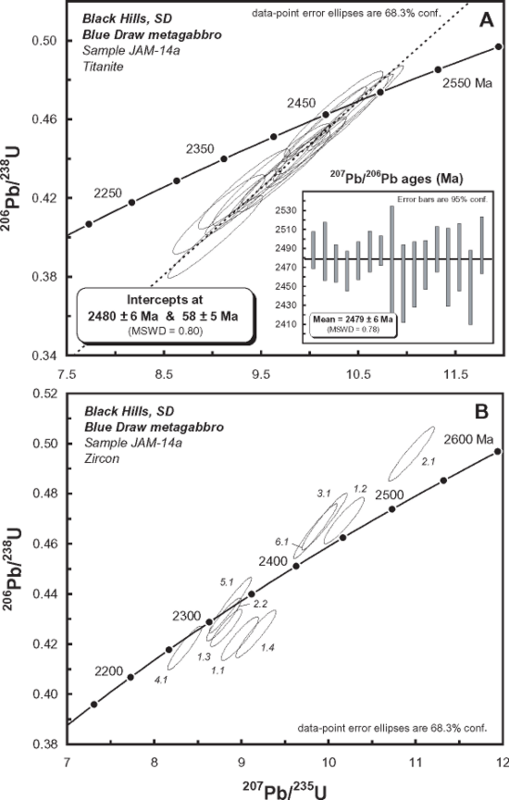 U-Th-Pb geochronology and preliminary interpretation of Precambrian events in the Black Hills, South Dakota. In The Trans-Hudson orogen. Edited by J.F. Lewry and M.R. Stauffer. Geological Association of Canada Special Paper 37, pp. 229-251. Roberts, H.R., 1999, Investigation of a polymetamorphic terrain in southwestern Montana using 40Ar/39Ar geochronology. Unpublished PhD dissertation, The Open University, Great Britain, 402p. Roscoe, S.M., and Card, K.D. 1993. The reappearance of the Huronian in Wyoming: rifting and drifting of ancient continents. Canadian Journal of Earth Sciences, 30: 2475-2480. Schmitz, M.D., Bowring, S.A., Southwick, D.L., Boerboom, T.J., and Wirth, K.R. 2006. High-precision U-Pb geochronology in the Minnesota River Valley subprovince and its bearing on the Neoarchean to Paleoproterozoic evolution of the southern Superior Province. Geological Society of America Bulletin, 118: 82-93. Southwick, D.L., and Day, W.C. 1983. Geology and petrology of Proterozoic mafic dikes, north-central Minnesota and western Ontario. Canadian Journal of Earth Sciences, 20: 622-638. Williams, H., Hoffman, P.F., Lewry, J.F., Monger, J.W.F., and Rivers, T. 1991. Anatomy of North America: thematic portrayals of the continent. Tectonophysics, 187: 117-134. Wintsch, R.P., Aleinikoff, J.N., and Yi, K. 2005. Foliation development and reaction softening by dissolution and precipitation in the transformation of granodiorite to orthogneiss, Glastonbury Complex, Connecticut, U.S.A. The Canadian Mineralogist, 43: 327-347. Wirth, K.R., Vervoort, J.D., and Heaman, L.M. 1995. Nd isotopic constraints on mantle and crustal contributions to 2.08 Ga diabase dykes of the southern Superior Province. In Proceedings of the 3rd International Dyke Conference, Jerusalem, Program and Abstracts, p. 84. Woo, C.C. 1952. The Pre-Cambrian geology and amphibolites of the Nemo district, Black Hills, South Dakota. Unpublished PhD dissertation, University of Chicago, 148p. This research was funded by NSF grants EAR-9909433 and EAR-0106987 (awarded to P.S.D. ), and EAR-0107054 and EAR-0137546 (awarded to K.A.F. ), which are gratefully acknowledged.